If you were an ‘Indefatigable OB or Member of Staff’ we welcome your own ‘LINKS’ here too: IOBA Members will have preference and priority. Steve Humphries (IOBA Vice Chairman: steve_c_humphries@btinternet.com) will be responsible to vet. The old school is now owned by the MOD as the ‘Joint Services Mountain Training Centre (JSMTC) Indefatigable’. Sea Cadet Corps (SCC) working with the IOBA – Awarding ‘The TS INDEFATIGABLE CUP’ to the ‘MOST IMPROVED UNIT, in the whole of the UK, annually. general support to all professional seafarers of all ranks and rates from all sea services. Its beneficiaries include serving, former, and prospective seafarers. Maritime Volunteer Service: Menai Bridge Unit seek new recruits and feel TS Indefatigable alumni, who are either retired or still active but in either case residing in the area, would make splendid Unit members. Indeed any alumni near any of our Units nationally would be welcome members there. Their organisation is a very worthy cause. 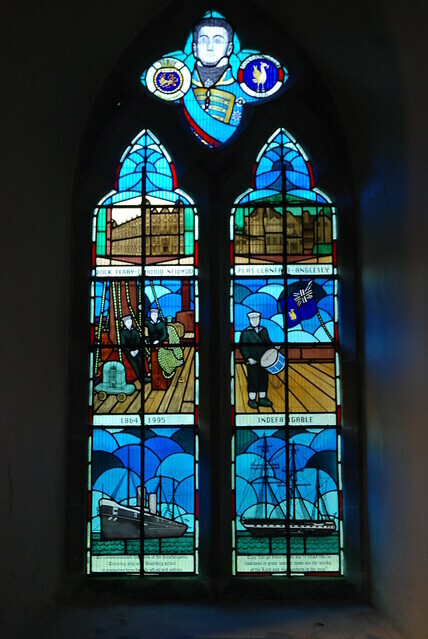 A more modern stained glass window in the north wall of the nave commemorates the work of the Indefatigable Nautical Training School which was located nearby from 1864 until its closure in 1995. I was in the 1944 intake: After several years at sea – from bridge boy on the Arundel Castle, D B to AB on coal burning Tankers and Caribbean tramps . I remember those who taught me well about life to come, as well as seamanship – Dad Mash, seamanship – Doody, the quartermaster – Dad Highway , Master at Arms – Dad French – Dad Wells – Chief Jimmy Unwin, who delivered the cane … how could anyone forget Captain Hard-line Bambra. I became a novelist and have written 20+ bestsellers in various counties. My publishing agent in New York is preparing a ‘Legacy’ web-site of my books and Life story … I am 85 this year and still writing. My books can be aquired from Amazon – I have one in progress and when ready for publishing i’ll give you details. Meanwhile May I give you my Website in case any of the boys a still with us may want to get in touch: paikitfai.com … it is my Chinese name. Upon retiring, I returned to school at the University of Windsor to study history. In a third year project I had to find a Wikipedia page that is not well written and edit or create a new page. I looked into the Indefatigable and found that the only mention was in a paragraph relating to HMS Phaeton. I decided therefore to create a new page for the TS Indefatigable. It was difficult to find non web- site sources, which was part of the criteria for creating the site in the class, it had to be a historical record. As of today the site is up and running, I have listed the main historical information that I was able to locate. It obviously needs much fleshing out, particularly how the school finished up closing. I have sent an e-mail to Steve Humphries to enlist his help through the Old Boys Association for any additional information on the school. If you take a look at HMS Conway’s Wikipedia page you will find it is several pages long, my goal is to exceed what they have done. I often stopped in at the Inde whilst travelling from Nottingham to Ireland via Holyhead and saw the slow decline of the school. When it changed to a more academic school I thought it might have a chance of survival. However, in the summer of 1995 on the way to Ireland I spent two days in Bangor with a view to exploring Snowdon and visiting the school. The hotel owner informed me that he thought the school might not re-open for the fall term, and when we visited the school the gates were locked and we were not able to get into the grounds. I live in Canada now and have only been able to attend one reunion, the 25th anniversary reunion which was also the 50th anniversary of my leaving the Inde in 1958. To add to the site you must first create a Wikipedia account, then you are able to go on to the Inde site, press edit and add additional information. An item that the Old Boys Association could add, for example, is the list of captains at the Inde, and I am sure there is much more that all the ex-Inde boys throughout the world could add. All you have to do is create an account with Wikipedia, go to the Indefatigable page, press edit and add information. I am really excited about this and look forward to seeing all of you getting involved. So, spread the word through the IOBA and lets get the ball rolling. In the hope of having the nonsense knocked out of me my father sent me at the tender age of fourteen to the Indefatigable, a tough sea-training school. This only strengthened my resolve for a life at sea, and I joined the Royal Navy at 15, before transferring to the Royal Australian Navy, where he served for eight years in the Far East, Antarctic waters and the South Seas. In Vietnam I saw active service in a carrier task force. The Daniel Adamson (the Danny) is the last remaining steam powered, passenger carrying, tug tender in the UK and she has been lovingly restored by a team of dedicated volunteers. In April 2017 the Danny will begin her first full season of sailing which will mainly be along the Manchester Ship Canal and the River Weaver as well as opening to the public at Ellesmere Port, the Albert Dock and Salford Quays. She is crewed/staffed by volunteers, the Preservation Society has asked us whether any of our members would be interested in any of our volunteer positions. They are looking for skippers, stewards, chief engineers, assistant engineers, firemen, trimmers and deck crew. Website of the Royal Naval Museum, in Portsmouth’s Historic Dockyard – the only museum devoted to the ships of the Royal Navy and the men and women who served in them. This multimedia centre aims to provide visitors with an insight into the range of activities on which the RN is involved. The images, video and interactive features demonstrate the range of environments the RN operates, extending from training through to frontline working conditions including images from recent conflicts. Liverpool Connections, a web site devoted to the history, up to the present day, of Liverpool. The Mother OF All Maritime Links – huge! Founded in 1864 HMS Indefatigable was fitted out by the Bibby family. In 1914 she was replaced by HMS Phaeton which became the second Indefatigable. She was moored close to the Conway off Rock Ferry Pier. In 1941, as with Conway Cadets, Indefatigable boys were moved away from the Mersey and ashore. The ship was renamed Carrick II and moved to Glasgow where she still lies. Like Conway in 1944 Indefatigable moved to shore accommodation in Plas Menai below the Tubular Bridge on the Menai Straits, Wales, UK. She survived until 1995 when dwindling numbers forced her closure. Her last Headmaster was a Conway. Pangbourne was established in 1917 and still survives to this day in Pangbourne, near Reading by the Thames. Whilst she is no longer a nautical training establishment there is a strong seafaring tradition and nautical roots. Pupils wear dark blue Royal Navy dress, attend Divisions on Sundays. The college clock chimes the bells of the watch.. They are erecting a Falkland Islands Chapel (the relocated and rebuilt Elim Church from Salisbury) in memory of those seamen who gave their lives in the Falklands. This includes 14 OPs.